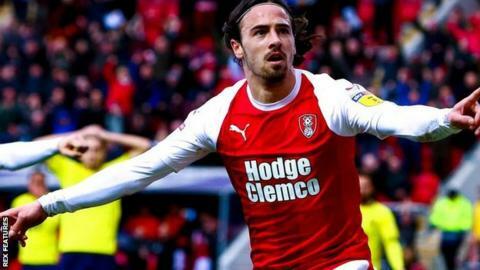 Defender Semi Ajayi scored twice as Rotherham ended a run of five consecutive draws to dent out-of-form Blackburn's fading play-off chances. The Nigerian's first came inside two minutes when he headed home a trademark long throw by Will Vaulks. Rovers, who have now lost five of their past six matches, levelled through Amari'i Bell's close-range strike. But Ryan Williams poked in to make it 2-1 and Ajayi powered in his third goal in three games from a Vaulks cross. Charlie Mulgrew's emphatic penalty in injury-time brought hope for the visitors, however Rotherham held on for a victory which would have taken them out of the relegation but for Reading's dramatic late win over Ipswich. Rotherham, who had failed to win any of their past four home league matches, caused Rovers problems from set-pieces throughout. After Ajayi's early effort, Jon Taylor and Richard Towell went close from long throws, while Vaulks shot wide from a tight angle. Bell's simple finish following a Mulgrew free-kick drew Rovers level as they improved after the break in an increasingly open match. But midfielder Williams and Ajayi ensured victory despite Mulgrew's 93rd-minute spot-kick, after Michael Ihiekwe fouled Danny Graham, causing a few late concerns. Rovers drop to 17th, 10 points off the play-off places and 11 above the relegation zone while the Millers remain in the bottom three on goal difference. ​​"Overall I am really proud of the points and the lads for digging in. All we can do is try and win and it looks like we have pulled other teams into it.​ We don't make it easy, but we are good value for money." ​"We came out of League One, like Rotherham. You have to improve and get better, we have to do the same. Match ends, Rotherham United 3, Blackburn Rovers 2. Second Half ends, Rotherham United 3, Blackburn Rovers 2. Offside, Rotherham United. Will Vaulks tries a through ball, but Matt Crooks is caught offside. Substitution, Blackburn Rovers. Harrison Reed replaces Elliott Bennett. Goal! Rotherham United 3, Blackburn Rovers 2. Charlie Mulgrew (Blackburn Rovers) converts the penalty with a left footed shot to the top left corner. Michael Ihiekwe (Rotherham United) is shown the yellow card for a bad foul. Penalty Blackburn Rovers. Danny Graham draws a foul in the penalty area. Penalty conceded by Michael Ihiekwe (Rotherham United) after a foul in the penalty area. Bradley Dack (Blackburn Rovers) hits the right post with a left footed shot from the centre of the box. Assisted by Elliott Bennett with a headed pass. Attempt missed. Will Vaulks (Rotherham United) right footed shot from outside the box is close, but misses to the right from a direct free kick. Lewis Travis (Blackburn Rovers) wins a free kick in the defensive half. Attempt blocked. Joe Nuttall (Blackburn Rovers) right footed shot from outside the box is blocked. Attempt blocked. Joe Rothwell (Blackburn Rovers) right footed shot from the centre of the box is blocked. Assisted by Joe Nuttall. Attempt missed. Elliott Bennett (Blackburn Rovers) right footed shot from the centre of the box misses to the left. Attempt missed. Ben Wiles (Rotherham United) left footed shot from outside the box is just a bit too high. Assisted by Ryan Williams. Goal! Rotherham United 3, Blackburn Rovers 1. Semi Ajayi (Rotherham United) header from the centre of the box to the top right corner. Assisted by Will Vaulks with a cross. Corner, Rotherham United. Conceded by Ryan Nyambe. Attempt missed. Joe Rothwell (Blackburn Rovers) left footed shot from outside the box misses to the right. Assisted by Lewis Travis. Substitution, Blackburn Rovers. Joe Nuttall replaces Adam Armstrong. Substitution, Rotherham United. Matt Crooks replaces Jon Taylor because of an injury. Offside, Blackburn Rovers. Charlie Mulgrew tries a through ball, but Danny Graham is caught offside. Delay in match Jon Taylor (Rotherham United) because of an injury. Attempt saved. Charlie Mulgrew (Blackburn Rovers) left footed shot from outside the box is saved in the top right corner. Foul by Clark Robertson (Rotherham United). Foul by Ryan Williams (Rotherham United). Foul by Joe Rothwell (Blackburn Rovers). Billy Jones (Rotherham United) wins a free kick in the defensive half. Attempt missed. Bradley Dack (Blackburn Rovers) right footed shot from the left side of the box is close, but misses to the left. Assisted by Adam Armstrong. Corner, Blackburn Rovers. Conceded by Michael Ihiekwe. Attempt missed. Bradley Dack (Blackburn Rovers) right footed shot from the right side of the box is close, but misses to the left. Assisted by Elliott Bennett. Attempt missed. Danny Graham (Blackburn Rovers) header from the left side of the six yard box is close, but misses to the left. Assisted by Elliott Bennett with a cross. Attempt missed. Clark Robertson (Rotherham United) header from the centre of the box misses to the right. Assisted by Will Vaulks. Offside, Blackburn Rovers. Joe Rothwell tries a through ball, but Adam Armstrong is caught offside. Corner, Blackburn Rovers. Conceded by Jon Taylor.